Hi everyone! I hope you are all having a great Friday! 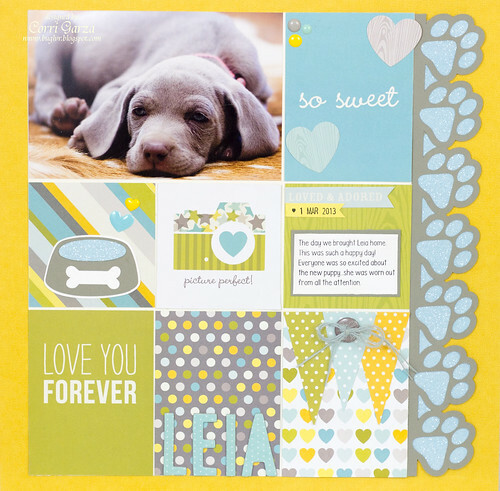 Today I'm sharing a layout with this adorable picture of our dog Leia when she was a puppy. I've had this photo sitting on my desk for a while and finally made a layout with it. This was taken after a full day of playing with the kids. We surprised them with a new puppy after telling them no for weeks. I used one of Simple Stories Snap kits and some die cuts from the Silhouette store. I loved how the gray in this paper matched her coloring so well. Adorable! Love the paw prints to the right of the page, thank you for sharing!